Looking for chimney services or repairs? Turn to Chimney Solutions, serving Dawsonville GA and the Greater Atlanta area including Smyrna GA, Alpharetta GA, Marietta GA, and Canton GA.
CSIA certified chimney sweep crew offers chimney repair & maintenance services like fireplace cleanings, chimney inspections, chimney crown rebuilding, fireplace insert installations, liner replacement, and more. 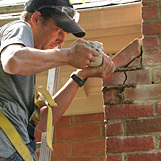 Providing quality chimney services for Dawsonville GA and the surrounding towns & communities, Chimney Solutions has become the favorite chimney contractor in the Greater Atlanta area. Established in 1998, we have been delivering top notch customer service and high quality workmanship to residents across the area for nearly two decades. Our dedication & reliability has garnered us thousands of satisfied customers and local residents have been glad to recommend us to their neighbors, family, and friends since they know we stand behind the work we complete. Every job completed by Chimney Solutions is performed by a CSIA trained & certified chimney technician to ensure the best quality workmanship that meet the highest of industry standards. You can’t miss our distinctive company vehicles as they travel across Dawsonville, down Shoal Creek Rd, along Rt 53 & Rt 9, and even Gold Creek Dr. Locals have come to know the friendly faces of Chimney Solutions and return to us annual to complete their yearly chimney maintenance. From chimney inspections to chimney waterproofing, masonry repair to tuckpointing, and chimney cap installation to firebox rebuilding, you can count on us for any of your chimney needs. 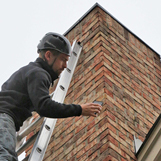 The chimney experts at Chimney Solutions are highly skilled and capable of handling a full range of chimney maintenance tasks. We are fully insured and our professional technicians will always arrive on time and in a clearly marked company vehicle. As the trusted chimney sweep of Dawsonville GA, we remain good standing members of the National Chimney Sweep Guild and the Chimney Safety Institute of America so that we stay current with changing industry standards & best practices, plus we always offer the best and most innovative new products to hit the market. Don’t get fooled by “cheap sweeps”. These unscrupulous companies call themselves chimney contractors but that’s far from the truth. Baiting homeowners in with low prices, they seek out people who are uniformed about their chimney system. Once they arrive on site to perform a “cursory” inspection, they inform the homeowners of major problems that should be fixed immediately. Don’t fall for this scam affecting the industry! In almost every case, there is no extensive damage to be repaired, but instead these companies are simply trying to upsell homeowners into expensive services which aren’t required or necessary. Many of these companies are neither insured nor certified so make sure to check credentials when hiring a chimney sweep. Before agreeing to any costly repairs, get a second opinion from a reputable local chimney sweep. Dawsonville Chimney sweeps service fireplaces, chimneys, stoves, venting systems, and more in the Greater Atlanta area including Dawsonville GA, Smyrna GA, Woodstock GA, Canton GA, & Johns Creek GA.
Our chimney sweep professionals deliver top quality chimney services you deserve at a price that is fair & honest.